We are offering Stainless Steel Bucket to our clients. With a stylish dimpled exterior, the Stainless Steel Dimpled Oval Beverage Tub completes the perfect party, just add ice and a selection of your favourite bottles. 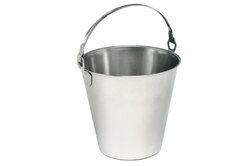 The high quality stainless steel walls make this pail durable and practical. Each tub has carry handles integrated into the sides for easy transportation, making it ideal for using at BBQs and parties. Our reputation in the market is largely judged in the market creating Stainless Steel Bucket. They are available in many specifications. 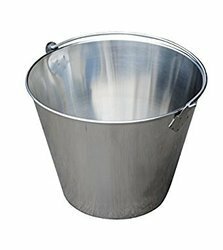 We are leading manufacturer and exporter of Stainless Steel Buckets and our product is made up of good quality. Mini Serving Balty made of Stainless Steel & Colouful G.I.